Preheat the oven to 180°C. Mix together the butter and sugar until light and fluffy. Sift the flour, baking powder and salt and add it alternately with the milk to the butter mixture. Stir in the apples and Staffords Choc Chips and pour into an 80 mm square baking dish. Mix the sauce ingredients together and pour over the apple mixture. Bake until the apples are cooked, about 30 minutes. Serve while still hot. Serves 4 – 6. Preheat oven to 180ºC. Brush a 6-hole muffin tin (large capacity) with melted butter or baking spray. Sift the flour into a large bowl; make a well in the centre. Add the eggs, Vesuvio Olive Oil, mixed berries, yoghurt and sugar. Using a hand blender, mix the batter until just combined. Batter should be lumpy. Spoon three-quarters of the mixture in each muffin hole. Equally portion the cream cheese and Staffords Choc Chips and place a portion on each muffin. Spoon the rest of the batter over. Bake for 30 minutes, until the muffins are golden brown. Using a flat-bladed knife, turn the muffins out onto a cooling rack. When cool, dust with icing sugar to serve. Pre-heat oven to 180ºC. Beat butter and sugar together until light and fluffy, using an electric beater; add the Staffords Rose Water and beat for another two minutes. Add flour slowly while kneading the dough together. Roll into 250 mm logs. Wrap in cling film and refrigerate for an hour. Cut into 10 mm rounds, place on greased baking tray, and bake uncovered for about 10 minutes or until lightly brown. Allow to cool. Preheat oven to 180°C. Melt the Staffords Dark Choc Discs and milk over low heat, preferably in a double boiler. In a large bowl, cream the butter, sugar and Staffords Vanilla Extract. Slowly blend in the chocolate-milk mixture. In a separate bowl, combine the flour and salt. Mix slowly into the chocolate-butter mixture, and fold in the almonds. Form dough into 40 mm balls and roll in sugar. Place on a greased cookie sheet. Bake balls for 12-15 minutes (until the cookies are set but not dark brown). Line two baking trays with greaseproof paper. Beat the egg whites until soft peaks form, taking care not to over-beat. Beat in half the castor sugar a little at a time, then beat until the mixture is stiff and glossy. Fold in the remaining castor sugar with a large metal spoon. Divide the mixture in half and stir a few drops of pink food colouring into one half. Use two teaspoons to scoop dollops of the meringue mixture onto the baking trays. Sprinkle each one with flaked almonds. Bake in a preheated oven at 140°C for one hour, then switch off the oven and leave the meringues in the oven to dry out. 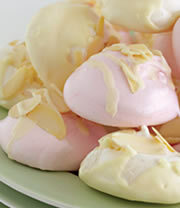 Once they have cooled completely, dip the bottom of each meringue into melted Stafford White Chocolate. Leave upside down on the baking tray until the chocolate has hardened. 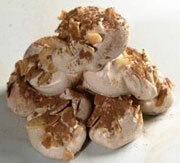 Alternatively, you can also drizzle the melted chocolate over the meringues for added decoration. Melt Staffords Milk Choc Disks in double boiler and then remove from heat. Separate eggs, add yolks to the melted chocolate and mix well. Beat egg whites in a separate bowl until stiff peaks form. Whip cream until it is also forming stiff peaks. Add cognac, fold in chocolate mixture and egg whites to the cream. Add the caster sugar and mix well. Refrigerate for 2 hours. 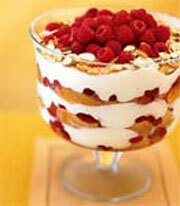 Garnish with Strawberries or fresh fruit and cream. Combine the biscuits, melted Staffords Dark Choc Disks and butter and press into the base of a round tin. Refrigerate for 30 minutes, or until firm. 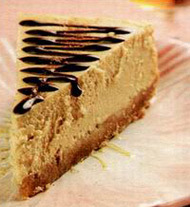 Beat the cream cheese, golden syrup and sugar with a hand blender until light and fluffy. Add the eggs, one at a time, beating well after each addition. Fold in the Staffords Rose Water and lightly whipped cream. Spread over the base and bake for 25 minutes, or until just set. Turn off the oven and cool with the door slightly ajar. Remove from the tin and trim the edges. Decorate using fresh small rose petals and lightly dust with icing sugar. Preheat oven to 175ºC. 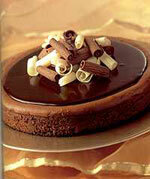 In a large bowl, stir together the flour, sugar, cocoa powder, baking powder and salt. Pour in water, vegetable oil and Staffords Vanilla Extract; mix until well blended. Spread evenly in a 230 x 330 mm baking pan. Bake for 25-30 minutes, until the top is no longer shiny. Let cool for at least 10 minutes before cutting into squares. If you prefer them more crispy, cook for slightly longer. Preheat the oven to 200ºC. Line a 220 mm spring form tin with baking paper and grease the paper. 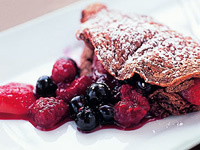 CRUST: Mix the biscuits, liqueur and butter and press the mixture onto the base of the prepared tin. FILLING: Heat the Staffords Milk Choc Disks and cream in a double boiler or in the microwave oven until the chocolate has melted. Beat together the cream cheese and sugar until smooth. Add the eggs, stirring well. Add the melted chocolate mixture, liqueur and salt and mix. Pour the filling into the prepared crust and bake for 15 minutes. Reduce the temperature to 180ºC and bake for another 15-20 minutes. Leave to cool completely and chill in the fridge overnight. Serves 8 – 10. Preheat oven to 175ºC. In a large bowl, beat together the butter, Staffords Vanilla Extract and sugar until light and fluffy. Sift together the salt and flour and mix into the butter mixture. Fold in the Staffords Choc Chips and nuts. Mix until well blended. Press batter into a 450 x 250 mm pan. Bake 20 minutes or until golden brown. Cut into bars and let cool in pan on wire rack. Sift the flour, baking powder and salt, then stir in the sugar. Combine the egg, milk, and oil. Add the liquid ingredients to the flour mixture. Mix well before stirring in the Staffords Choc Chips. Fry a ladle at a time in a non-stick frying pan. Turn when bubbles form on the surface and cook until both sides are golden brown. Keep warm. For the honey sauce, heat the honey, butter and cinnamon. 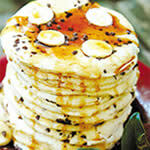 Serve drizzled over the pancakes, along with cream or ice cream. Serves 8. Preheat the oven to 1800C. Lightly grease cookie sheets with butter. Melt the Staffords Dark Choc Discs in a double boiler over barely simmering water. Remove from hot water and set aside to cool for at least 5 minutes. In a large mixing bowl, beat the egg whites until they hold stiff peaks. Add the sugar, 1/4 cup at a time, continuing to beat until the mixture is smooth and glossy. 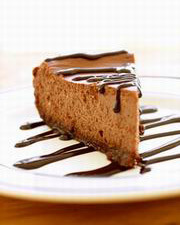 Fold in the melted chocolate, crumbs and Staffords Vanilla Extract. Drop mixture by level teaspoonfuls, about 1 1/2 -inches apart, onto the prepared cookie sheets. Bake for 15 minutes, or until the meringues are dry and the bottoms are lightly browned. Preheat the oven to 170 ºC. Grease a 240 mm pie dish with margarine. Place the rice, milk, evaporated milk and spices in a large saucepan and bring to boil. Stir continuously. Simmer gently until the rice is cooked and nearly all the liquid has been absorbed. Add the honey and cool slightly. Beat the egg yolks lightly and stir into the rice mixture. Spoon into the prepared dish. Spread the surface of the mixture with Staffords Lemon Curd and arrange the orange segments on top. Beat the egg whites until soft peaks form. Add the castor sugar by the spoonful while beating continuously. Spoon meringue onto the tart, spreading it over the entire surface. 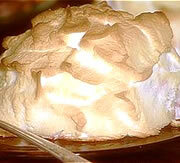 Bake for 20 minutes or until the meringue turns pale brown. Serve hot. Serves 6. Mix together the melted Stafford Dark Choc Discs, coffee and butter until the coffee has dissolved. 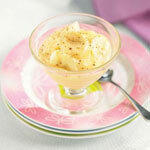 Using a hand blender, whisk the eggs and sugar together until it leaves a trail behind, and it is lighter in colour. 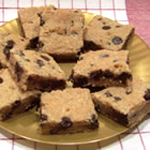 Lightly fold into a lightly greased glass dish (oven safe) and bake for 20-30 minutes. Cool for 10 minutes, then remove from the dish and completely cool the brownies. Portion the brownies into 16 squares, and to decorate, melt some Staffords Dark Choc Discs and dip some coffee beans in, set aside on greaseproof paper until the chocolate has cooled and place a few on top of each brownie. Preheat the oven to 180ºC and put a pan of water in the oven. Line a 220 mm spring form tin with baking paper and grease the paper. CRUST: Mix the biscuits and melted butter and stir in the liqueur. Press the crust onto the bottom of the prepared tin. FILLING: Beat the cream cheese, mascarpone cheese and sugar until smooth. Mix in the liqueur and coffee granules. Slowly stir in the eggs and flour until just blended. 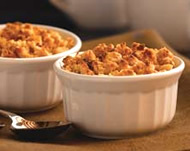 Turn the mixture into the prepared crust and bake for 40-45 minutes or until just set. Open the oven door, switch off the oven and leave the cake to cool in the over for 20 minutes. Remove and leave to cool completely. Chill in the fridge for at least three hours before serving. TOPPING: Heat the Staffords Dark Choc Disks, cream and coffee, stirring until the Staffords Dark Choc Disks have just melted. Drizzle over the cake in a zigzag pattern. Serves 8-10. Preheat the oven to 180°C. 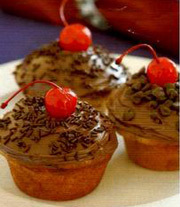 First make the cup cakes. In a mixing bowl, cream together the butter and sugar until light and fluffy. Gradually mix in the beaten egg, mixing thoroughly between each addition to prevent the mixture from curdling. Mix in the Staffords Vanilla Extract. Using a metal spoon, fold in the flour, then mix in the milk. 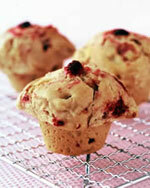 Divide the mixture among 12 paper cup cake cases and place in a 12 cup muffin tin or on a baking sheet. Bake for 20-25 minutes until golden and springy to the touch. Remove from the oven and cool on a wire rack. Meanwhile, make the frosting. In a mixing bowl mix the butter gradually adding the icing sugar mixing very well until light and creamy. Add the milk and Staffords Vanilla Extract, mixing well. Divide the mixture into separate bowls to be coloured with your choice of colours. Using a cocktail stick, add the colours gradually until a pastel colour is reached. Spoon generous amounts of frosting onto the cooled cup cakes and swirl, using a warm, wet knife. Decorate the cup cakes using silver balls,Staffords Rainbow Vermicelli, sweets or crystallised flower petals. Leave to set for 30 minutes. Serves 12. Preheat oven to 180. Lightly grease baking tin and line with baking paper. Combine the raisins with rum in a small bowl set aside to soak. Place chocolate and butter in heatproof bowl and place over half filled sauce pan with boiling water remove from heat; allow to stand stirring occasionally until melted. Stir in the sugar and cream set aside and cool. 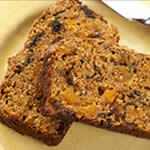 Sift in flour add raisin mixture combine all ingredients together with egg. Pour mixture into prepare baking tin bake for 20-25minutes or until just set. Cool and then refrigerate overnight before cutting into small pieces dust with cocoa and top with Stafford White Chocolate Discs. Melt Staffords 70% Cocoa chocolate and set aside to cool slightly. Place eggs and sugar in a large bowl and beat for 5 minutes. 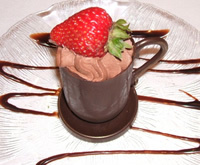 Fold in cooled chocolate and cocoa powder until combined. In a separate bowl, whip cream until thickened. Fold the cream into the chocolate mixture. Spoon into glasses and chill in fridge for at least 1 hour. 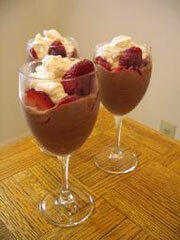 Remove from fridge 15 minutes before serving, then top with extra whipped cream and grated chocolate to serve. Serves 6. Beat 125g soft butter with 170g caster sugar. Add 5ml Staffords Vanilla Extract and 2 large eggs and beat well. Fold in the flour, Staffords Choc Chips and milk. Spoon into greased muffin or cupcake tins and bake at 200ºC for 12 to 15 minutes. Once cool, spread each cupcake with melted chocolate or chocolate spread, and sprinkle with Staffords Choc Chips or Choc Vermicelli. Top each one with a maraschino cherry. Fold Staffords Lemon Curd into whipped cream. Place a slice of Swiss roll in centre of each of 4 plates. Drizzle half the sherry over them. Spoon a little lemon cream onto each. Repeat layers. Mix raspberry purée with sugar to taste and pour over trifles. Serves 4. Brown the pistachios in a non-stick pan. Sprinkle with 5 ml sugar and stir until lightly caramelised. Allow them to cool. Brown the almonds in a non-stick pan. Sprinkle with 15 ml sugar and stir until lightly caramelized. Allow to cool. Beat the egg whites until stiff. In a microwave, melt the honey for 30 seconds. Whisking continuously, add the boiling honey in a thin stream to the stiff egg whites, until the egg whites are shiny and smooth. Beat in the Staffords Orange Flower Water or Staffords Rose Water. Beat the egg yolks and 105 g (125 ml) caster sugar together until the mixture lightens in colour, now fold in the egg-white mixture. Whip the cream until it forms peaks and fold into the nougat mixture. Set aside 50 g almonds and 20 g pistachios and in a blender coarsely crush the remaining nuts. 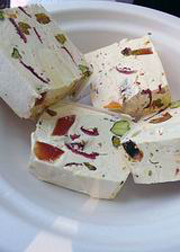 Fold the crushed nuts into the nougat mixture with the cherries. Line a loaf tin (280 x 100 mm) with non-stick plastic wrap. Pour in the nougat mixture and smooth the top. Cover with plastic and freeze for 12 hours. Remove from the freezer and keep in refrigerator for up to 4 hours until serving time. Just before serving, un-mould it onto a serving platter and serve with fresh cherries, the reserved caramelized nuts and a sprig of mint. Serves 10. Pour boiling water over raisins and currants to cover. Steep for 5 minutes, then drain. In a very large bowl, combine currants, raisins, gum drops, candied cherries, pitted dates, walnuts, spices, brandy and Staffords Apple Jelly. Stir to blend. Cover and let stand overnight. Preheat oven to 135ºC. Grease three 100 x 200 mm loaf pans. Cream the butter and the sugar together until light and creamy. Add the eggs one at a time, mixing well after each one. Stir in the Staffords Vanilla Extract. Sift the flour and baking soda together. Blend in the flour mixture alternately with the fruit mixture. Pour evenly into three loaf pans. Bake at 135ºC for 2 to 3 hours or until a toothpick inserted in the centre of the loaves comes out clean. Serves 30.